I realise that I have jumped headfirst into wintery recipes, but since that’s what the weather seems to have done, I thought I’d better follow suit. Sorry to those of you who live in places that are still excruciatingly hot (of which I am jealous, please adopt me) because I’m sure you’re not ready for a stew recipe, but I’m sure you’ll appreciate it eventually. 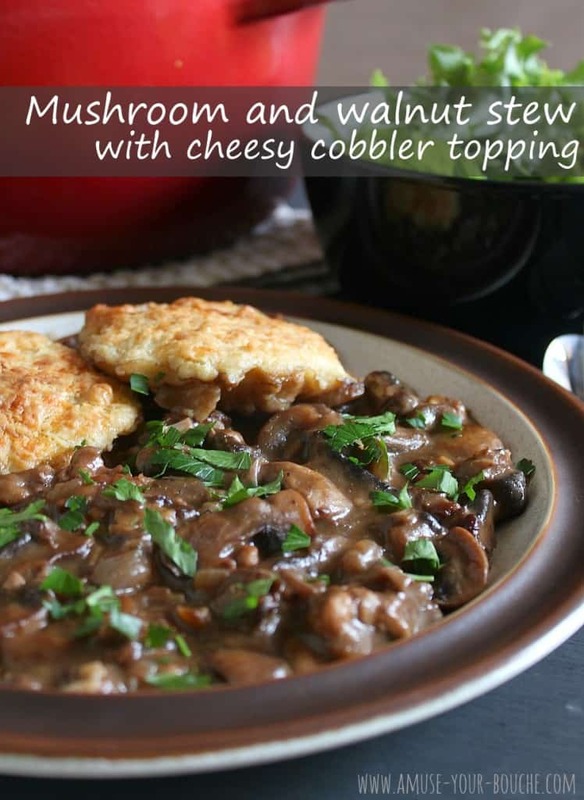 Anyway – mushroom and walnut stew with cheesy cobbler topping. 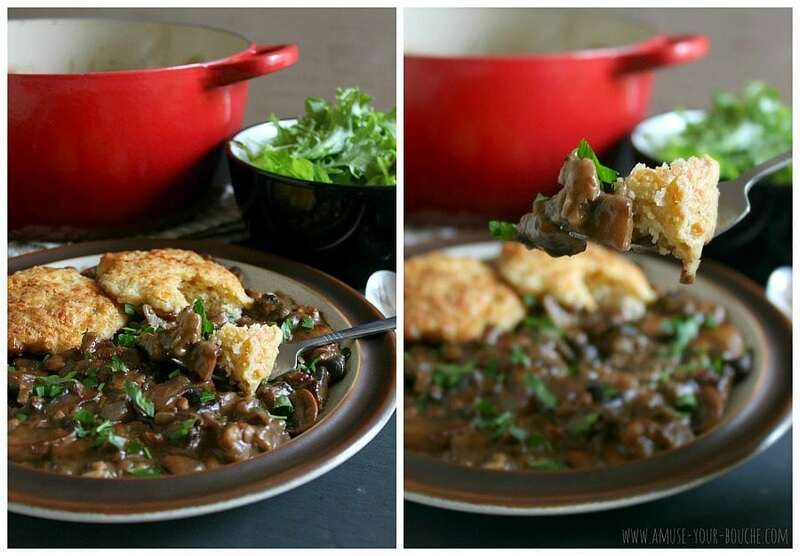 It’s essentially a mushroom cobbler, but that doesn’t sound nearly as exciting. I can’t believe how good this was. It had exactly the richness and heartiness that I was hoping for (it has wine in it! Wine!). And the cheesy cobbler topping was perfectly fluffy and scone-like, and the perfect thing to go with the thick stew. This recipe does take a little while to make, but most stews do, and it’s worth it for the depth of flavour that you get at the end. You can easily scale it up if you’re cooking for a whole family or if you want leftovers (I kind of wish I’d done that, I’d love to have a few portions of this for the freezer for the next time I want a quick dinner… or breakfast… or like, any time. Basically right now). I’m looking forward to using this same cheesy cobbler topping on other stews in the future. I’m also fantasising about having this stew alongside mashed potato – you can mix and match whatever you like. By the way it’d actually be quicker to make the stew with mash or something similar, because you can skip the whole ‘baking’ part and serve it up straight from the hob – the only reason it needs to be baked is to cook the cobbler topping. Oh, and it also creates awesome crispy bits around the edge of the pan which are amazing. I very much recommend you make this next time you’re tempted to turn the heating on. It’s a lot tastier than a hot water bottle. Heat the oil and butter in a large pan or casserole dish (if possible, use one that is both hob- and oven-proof), and cook the onion and garlic over a medium heat for 5 minutes until fairly soft. Add the mushrooms, and continue to cook for a further 5-10 minutes until all the vegetables are well cooked. Turn the heat down fairly low, and add the paprika, thyme and flour. Cook, stirring constantly, for one more minute and then add the red wine. Scrape any residue off the bottom of the pan, and turn the heat up a little to bring the mixture to a simmer. Simmer for a few minutes, and then add the stock and walnuts. If serving straight from the hob (e.g. alongside mashed potato), simmer for at least 10 more minutes to intensify the flavours. If using the cobbler topping, heat the oven to 200°C (Gas Mark 6 / 400°F). To make the cobbler topping, season the self-raising flour with salt and plenty of black pepper. Use your fingertips to rub in the butter until the mixture resembled breadcrumbs – don’t overwork it. Mix in the grated cheddar. Lightly whisk the egg with the milk, and then add this to the flour mixture. It should be fairly wet – if it looks too dry, add a dash more milk. Dollop the cobbler mixture onto the top of the mushroom stew, and brush lightly with a little more milk. Bake, uncovered for around 45 minutes, or until the cobbler topping is golden brown and a knife comes out clean. Top with freshly chopped parsley to serve. Dying to make this! Just wondering, for any American who have tried this, is it really 17 ounces of mushrooms? That seems like so much. Just wanted a sanity check! Thank you! I’m afraid I’m not sure how to do that, sorry :( If it’s any consolation, all my recipes are now written in both the UK and US formats – so you should be able to cook anything from the past two or three years without any problems! Made this yesterday and it was fantastic, although the stew didn’t seem to need quite as much liquid as the recipe said. 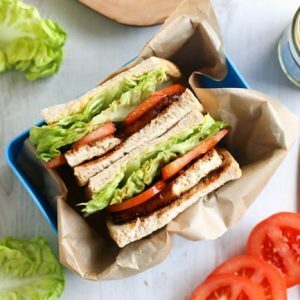 Just one complaint – why is the butter measured in tbsp and not in grams? Have you tried measuring solid cold butter with a tablespoon?? Hehe point taken, I actually agree with you about the butter – I think I was just trying to make it more American-friendly, since a lot of my readers are in the US. How on earth do Americans measure butter?! Butter sticks are marked in teaspoon increments. 3 teaspoons = 1 tablespoon. So, it doesn’t matter if the stick is frozen. I read this recipe and bought all the ingredients yesterday. Ready to make it today. But, I’m going to use my mashed cauliflower recipe as the topping, since I try to limit my carbs. Ah ok, that makes sense! Our butter doesn’t come in the same sticks yours does. Wow. This stew was delicious, especially the cobblers. Thank you for the recipe. 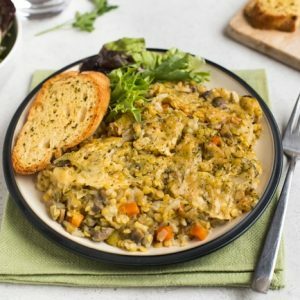 I used a slow cooker to make this, just added the cobbler mixture near the end. Turned out amazing. 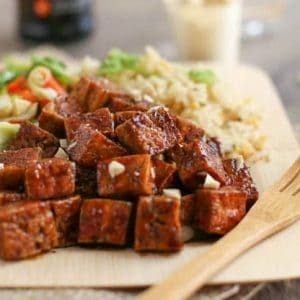 My husband tried this recipe and we loved it. 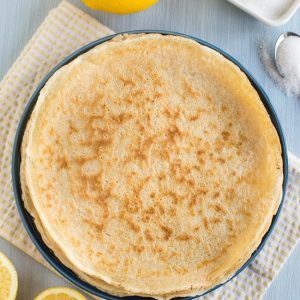 I’ll try some other recipes on this site! This was delicious! 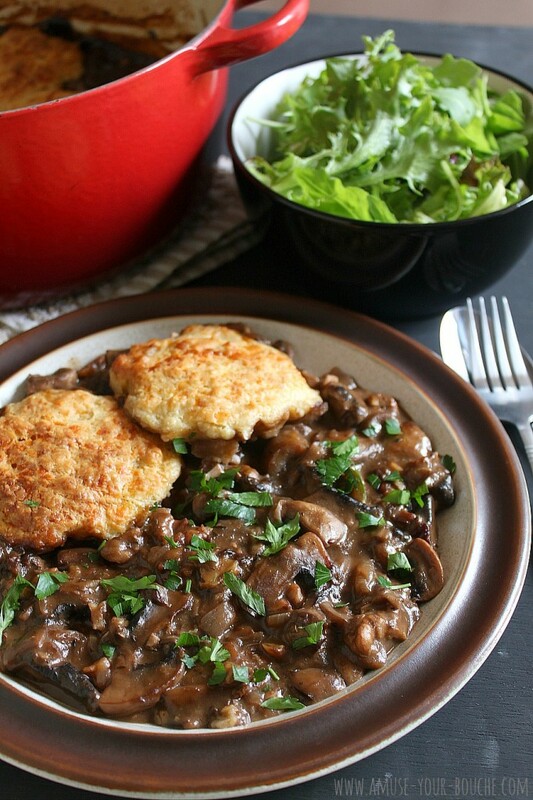 Mushrooms and red wine go so well together and the smoked paprika rounds up everything pretty nicely. 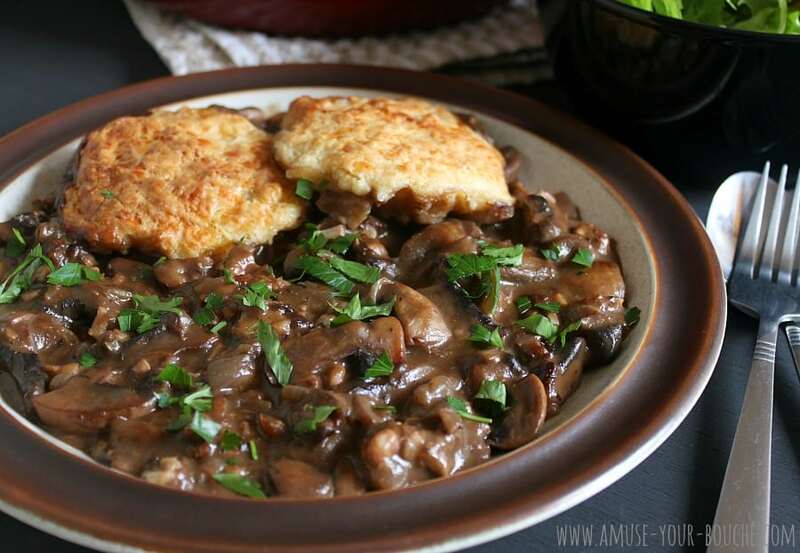 I am wanting to make this for my veggie friend and I (am a big fan of mushrooms but my hubbie hates them so I’m very excited to make this as don’t usually get opportunity to cook with mushrooms). I have all day today (Thursday) but I’m solid busy Friday and Saturday. My friend visits sat night. Would it be ok to make the stew today. Then refrigerate it and add cobbler on Saturday and bake in oven? Or will 2.5 days in the fridge ruin it? I think it’l; be fine to make it today – it’s only stew, it’s not like it’ll go soggy or anything like some things do! And yes, I’d add the cobbler on Saturday and bake it then :) enjoy!! Fantastic thank you and thanks for the speedy reply. I’ve made it and my only problem is going to be not eating it all to myself before Saturday! It smells amazing. I made it following your instructions to the letter. I’ve tasted it and it’s so yummy. I bet it sat marinating in itself in the fridge will even intensify the flavours! Can’t wait till Saturday. Thanks again. This looks wonderful. We just started summer here so I suppose I won’t be making it right away but I will definitely be making it. It is also the perfect excuse to purchase one of those cute little kitchen digital scales that I’ve been wanting for quite some time. :-) I have a veggie lasagna recipe that calls for zucchini and walnuts and it is amazing what the walnuts do for it so I expect great things from this one. The way I wrote that looks like I’m just talking to Becca. Sorry my grammar is wacky. This is so good! And yet I didn’t have enough time to bake the cobbler, so I tried the mashed potatoes option – it’s a great match. I substituted red port for the wine. I recommend you save one portion and eat it at room temperature or cool the following day, at work! Oh my goodness this is GOOD!!!!!!! I am so impressed. I had to use carrots to eke out the mushrooms & Port instead of red wine…. It is fantastic, & very easy. The cobbler topping as a big hit too… Thank you very much . 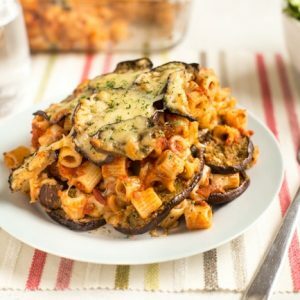 Hey this recipe looks amazing, mostly because I am extremely partial to mushrooms, but I was wondering… what is the purpose of the red wine in the recipe? I don’t have any at home, but I do happen to have red wine vinegar. Could I use that instead? Thank you for your reply! I’m looking forward to making this soon! Hi, I’m sorry but I can’t do that – it would take me HOURS to convert all of my recipes. I would very much recommend you buying a digital kitchen scale – you can get them for about $15 and they’re very useful. 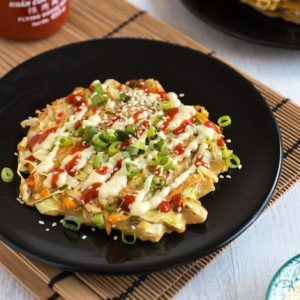 Is there anyone who has done the conversion for just this ONE recipe? ….that would be so helpful and glorious; thanks! Learn Metric! It’s so easy!! and do buy a digital scale. Cooking by weight is so much easier than stuffing/scraping cup measures. I grew up cooking with cups, so it’s definitely what I’m move familiar with, though one of these days I need to get a scale. These measurements worked out well, though I had to add quite a bit more milk to the topping (I used 1 cup of flour). The stew turned out delicious, though — probably one of the best things I’ve made in a while. I loved the rich flavor and the texture of the walnuts in it. Thanks so much for sharing! WHAT A LIFESAVER YOU ARE! Well I live in Prince Edward Island, Canada and unlike other Islands its quite chilly here already. Since it is the Fall Harvest on the Island it is bountiful with so many fresh foods to choose from and I have already started making soups. 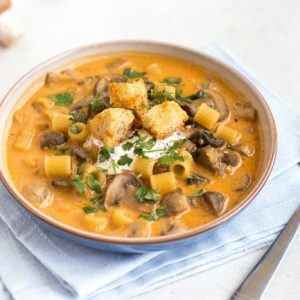 This recipe certainly looks wonderful and as mushrooms are one of my favorites I will defiantly be trying your recipe. Thanks for Sharing, Diane. It has taken me quite some time to warm up to mushrooms. My dad used to tell me they were poison so I’ve always had an issue with them. However, I’ve recently started experimenting so this must be on my list of things to try! That topping? It kills me, so yummy! The cheesy cobbler topping sounds perfect! This is going on my winter to cook list.. It looks yummy and warming! Loving the walnuts in it too!